California Manufactured Cannabis Bond (Manufactured Cannabis Safety Branch - Dept. of Health) • Surety One, Inc. According to the Department of Health, "The California Department of Public Health's Manufactured Cannabis Safety Branch (MCSB) is one of three state licensing authorities charged with licensing and regulating commercial cannabis activity in California. MCSB is responsible for regulation of all commercial cannabis manufacturing in California." Precisely as required by the Bureau of Cannabis Control and Calcannabis, applicants for licenses issued by the MCSB must file a California manufactured cannabis bond. The Department's mission within this division is to, "strive to protect public health and safety by ensuring commercial cannabis manufacturers operate safe, sanitary workplaces and follow good manufacturing practices to produce products that are free of contaminants, meet product guidelines and are properly packaged and labeled." The surety bond form, entitled "Commercial Cannabis License Bond" is a compliance obligation. It must be issued in the amount of five thousand dollars ($5,000) and guarantees compliance with the provisions of the Medicinal and Adult-Use Cannabis Regulation and Safety Act (Division 10 of the California Business and Professions Code (§ 26000 et seq.)). In addition to referencing the entire statutory chapter the bond also specifically guarantees the costs of destruction of cannabis or cannabis products if necessitated by a violation of law. 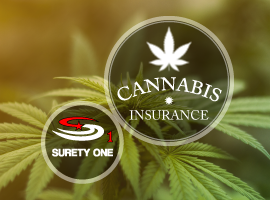 California surety bond leader, SuretyOne.com is the premier underwriter of the surety bonds needed by both the recreational and medical marijuana sectors. We firmly believe in supporting the availability of cannabis products to patients that benefit from them and will provide bonding to ethical manufacturers of cannabis products where permitted by law. We will consider applications for a California manufactured cannabis bond bond for start-up businesses, individuals and legacy cooperatives regardless of credit or financial statement condition. For further information contact us at (800) 373-2804, email Underwriting@SuretyOne.com or click here for a live chat.